KIEV, Ukraine -- Fancy a beer with a twist of political intrigue? 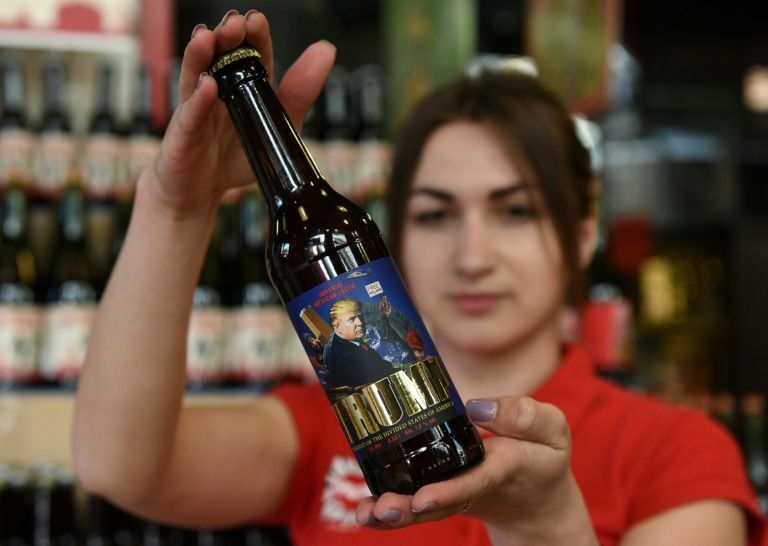 A craft brewery in Ukraine has cashed in on the frenzy surrounding Donald Trump's possible campaign links to Russia by bottling a lager with a label featuring the US president and Vladimir Putin peeking from behind. Ukrainian craft brewer Pravda bottles a beer labelled Trump "President of the Divided States of America". The Kremlin chief is wearing one of Trump's trademark "Make America Great Again" red caps while another man is holding up a "Free Melania" sign -- a reference to the First Lady. The Pravda pub in the western city of Lviv calls its bracing 14.4-proof creation "Trump. President of the Divided States of America". "For me, every bottle presents an opportunity to send a small message," Pravda co-owner Yuriy Zastavniy told AFP. "Our sarcastic view of the global march of populism is reflected in the name and the label design." The beer itself is identified as an "imperial Mexican lager with lime" and features a wall on the label that Trump has pledged to build with the southern US neighbour. Pravda's website urges its fans to drink up "to an unpredictable future". The pub also offers Trump on tap. The brewery has previously launched beers lampooning German Chancellor Angela Merkel and former US president Barack Obama. It also crafted a separate and especially biting edition featuring Putin and is now thinking of other leaders. "Sure, we can do one with (French President) Emmanuel Macron. But we will wait until it is politically relevant to Ukraine," Zastavniy said. The beer's first edition sold out within two weeks of its launch on May 2. A new batch is now on sale and Zastavniy said strong demand meant that Pravda would continue brewing the Trump lager for the foreseeable future. "We already have a preliminary agreement with a distributor for Austria and Germany," he said. Ukraine is locked in a bitter feud with its ex-Soviet neighbour Russia and has been concerned by Trump's campaign pledges to try to work more closely with Putin. Kiev blames Moscow for starting and backing a three-year war in the east of Ukraine that has killed more than 10,000 people. Zastavniy said that Putin's addition to the label seemed logical. "There are reasons to believe that Russia interfered in the US election, which would have improved Trump's chances," he said. US Deputy Attorney General Rod Rosenstein has appointed a special counsel to investigate any links Trump's campaign may have had with Russia. Moscow laughs off suggestions that it could have somehow played a role in Trump's unlikely rise from a billionaire magnate who starred in his own reality TV show to the presidency of the United States. But Trump's term so far has seen him reaffirm his commitment to Ukraine's territorial integrity and vow to press on with sanctions imposed after Russia's March 2014 annexation of Crimea.